The act of mowing your lawn might cause you to dread mowing near your garden beds. Invariably, the mower chews up mulch, spraying bits of dirt and debris onto the lawn. The simple fix to this problem involves digging a landscape edge around the perimeter of the garden. This edge creates a neat line in the form of a trench. The trench catches dirt and debris as well as provides a finished look to your landscape. Adding an edge between your garden and grass will also limit encroachment of the grass into the garden. This simple home improvement costs nothing except some of your time and elbow grease. Use the rake to pull back as much mulch as possible into the garden area. Clear about 2 feet of garden down to the soil. Begin at one end of the garden. Use either the spade or edging shovel. Place the shovel blade on the line between the grass and dirt at a 45-degree angle. 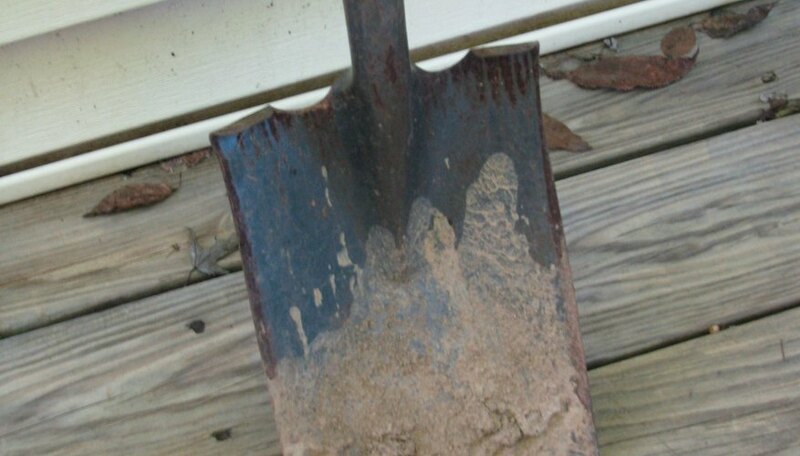 Step down onto the shovel, pressing into the dirt about half of the width of the shovel (6 inches). Lift the dirt into the cleared area of the garden. You can also use a spade for landscape edge trench digging, but you'll need to flatten the curve in the dirt created by the rounded shape of the spade. Proceed cutting into the ground down the length of the garden. When you've finished this step, you should have a V-shaped trench running along the garden edge with clods of pile in the garden. Use the spade to cut and break up the dirt clods. Pull out any weeds or grass to prevent these nuisances growing in the garden. Smooth the broken-up dirt into the garden, blending it into the existing surface level. This may create a mounding towards the front of the garden so blend as far back into the garden as needed to create a level surface. Draining can be affected by too much mounding of soil at the garden edge. Pull existing mulch or add new mulch to the garden bed. Pull the mulch down and into the trench in a 1-inch layer to hide the dirt. Edging allows you a cost-effective way to provide a definitive line between garden beds and your lawn. Edging usually last for one to two seasons so this type of edging isn't permanent. You will probably need to sharpen the garden edge each spring.